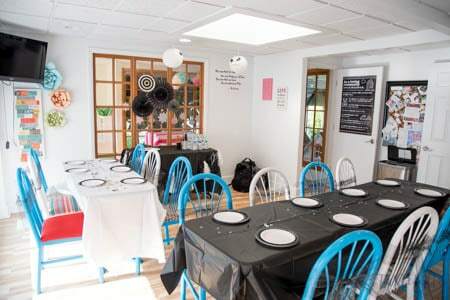 Bring Tim Burton’s classic Nightmare Before Christmas to life with this fun, low stress party setup and learn more about Storybrook Play Cafe in Salt Lake City, Utah. One of my boys’ favorite movies is Nightmare Before Christmas. No matter what time of year they LOVE to watch this show over and over again. I’m not going to complain because it’s one of my favorites too. My 4 year old especially loves the movie so I wasn’t surprised when we asked him what kind of party he wanted for his birthday and he said Nightmare Before Christmas. With it being over 100° outside and having a very active 10 month old having a party at the park or at our pool was out of the question. So we decided to have the party indoors somewhere with air conditioning and where the kids could play and run their energy out. We did his party at Chuck E. Cheese last year and while it was fun I felt like we spent more money than we had planned on because we had to keep buying more tokens. This year we decided to have his party at Storybrook Play Cafe in Millcreek. 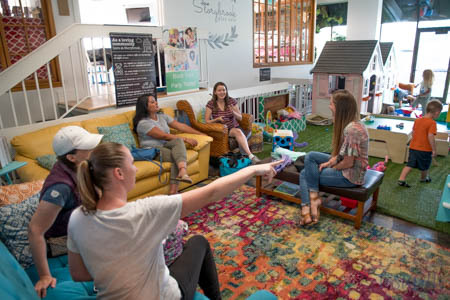 If you haven’t been it is seriously the PERFECT place for play dates, birthday parties or just somewhere to let the kids get their wiggles out. They have daily activities ranging from visits from princesses and superheros to Spanish lessons and even craft days as well as they offer summer camps perfect for any age. You can check out what’s going on every day on their schedule. When you walk in the whole first level is dedicated to play. 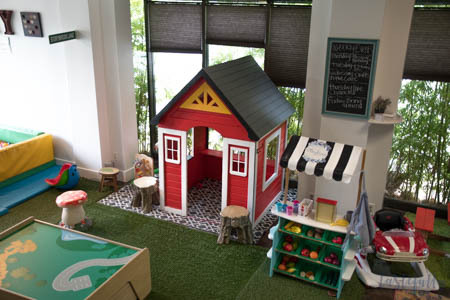 From the ball pit to the play houses, train tables, dress up bins and more. There are also comfy couches for parents to sit and chat or relax. Upstairs is the café with warm and cold drinks for adults and kids as well as lots of snack and lunch options. 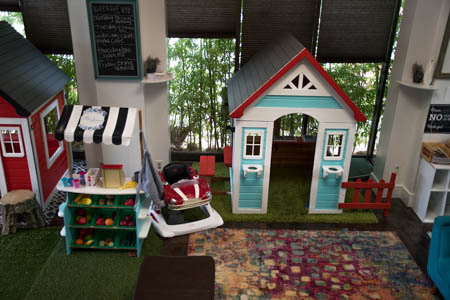 There is also another play room upstairs perfect for babies. 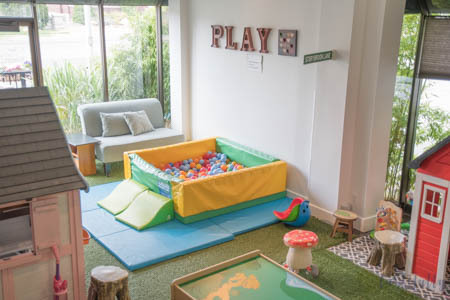 The play area is really designed to help nurture imaginations and let kids play in a fun, safe environment and is ideal for kids ages 1-6 (although my baby girl loves playing there too)! You can see why we chose Storybrook for our 4 year old’s party. It was perfect for him and 15 of his closest friends to run, play and get out of the heat. While the kids were playing the moms hung out upstairs and chatted. Another reason I chose Storybrook is I wanted this party to be easy to put together with little to no work on my part. The staff at Storybrook got the room all cleaned up for us before AND after the party. 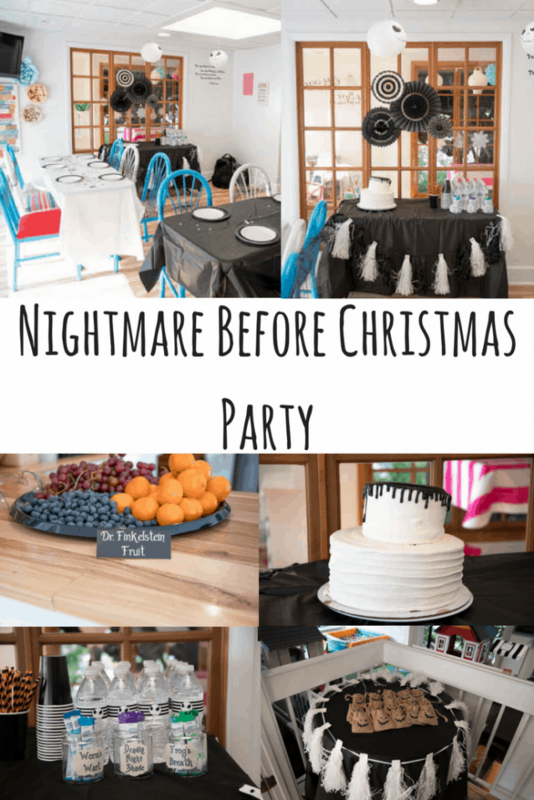 I stopped in to Zurchers the weekend before the party to pick up supplies and, thanks to their huge selection of everything party related, it took me less than an hour to make everything before hand AND to set everything up. 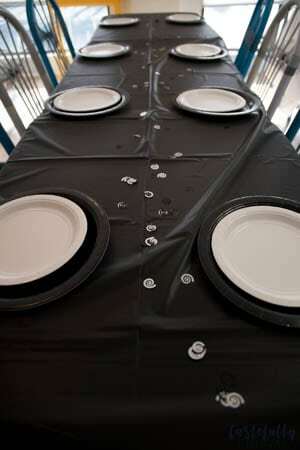 I used black and white tablecloths to cover the tables and sprinkled them with black swirl confetti I found on clearance at Zurchers to add a little sparkle. On the main table and the party favor table I hung tissue paper garlands to add a little dimension and above the main table I hung these fun paper fans on the wall. 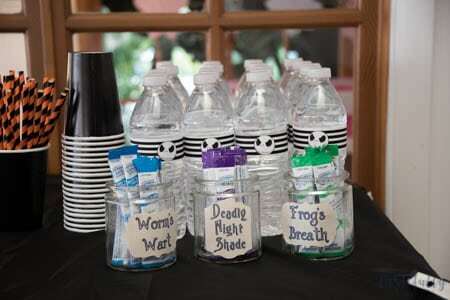 For our drinks I made Jack Skellington water bottle labels (download your copy for free here) and let the kids make their own “magic potions” with drink pouches. Tune in next week to see how I made the potion jars. And the star of the party (other than the birthday boy of course) was this amazing cake from Lindsey at LK Cooking. 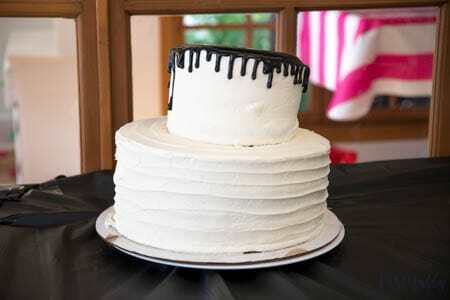 Not only was this cake GORGEOUS but it seriously was the yummiest chocolate cake I’ve ever tasted. Moist but not too rich and the cream cheese frosting she had on there paired perfectly with it. If you ever need a cake definitely give her a call (she is a personal chef and does cooking classes for kids too). For the rest of the food I kept it really simple. 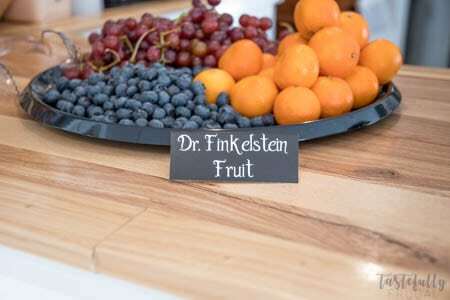 We had Pumpkin King Pizza (aka Little Caesars), Sally’s Salsa and chips (this is the recipe I used for the salsa) and Dr. Finkelstein’s Fruit. 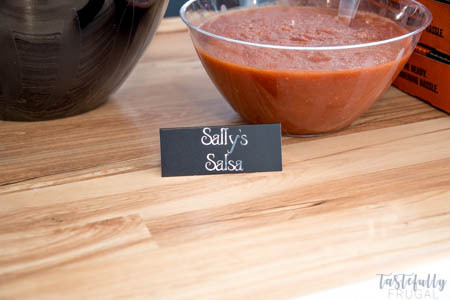 I made the signs with chalkboard place cards and adhesive foil. Lastly we had the party favors. 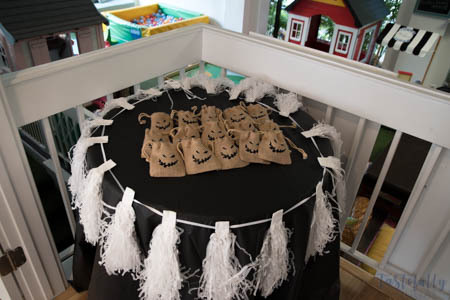 I picked up these burlap bags at Zurchers as well and turned them into Oogie Boogie. I’ll be sharing the tutorial for these next week too. When all was said and done this was the easiest party I’ve done in big thanks to Storybrook, Zurchers and LK Cooking and it was one of the funnest too. Now that I’ve got a few parties under my belt I’ve learned the best ones are the ones where mom isn’t stressed and the kids have lots of time to play and enjoy their friends. 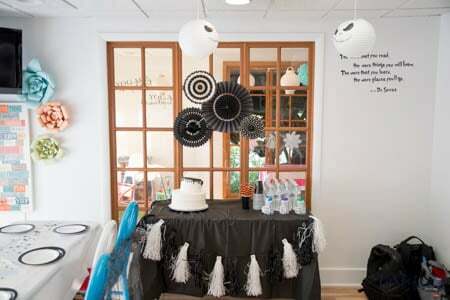 What are some of your best tips for making birthday parties fun and enjoyable for everyone? 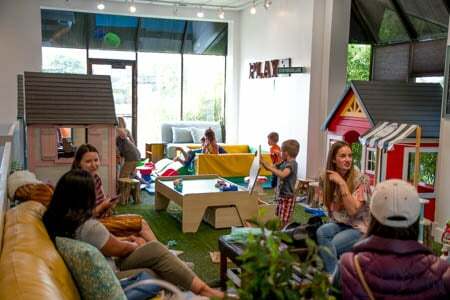 Storybrook Play Cafe is such a fun place! 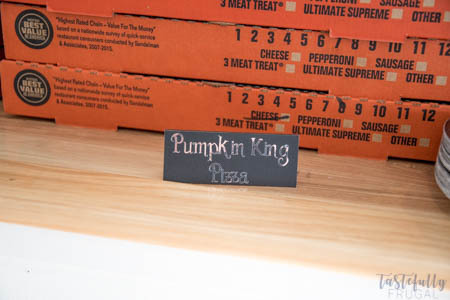 This party was so much fun and I love all the details you added to the party. This is the perfect place for a party!